The Imperial race emerged out of the original Nibenese tribesman, Nedes and Cyro-Nords in the Merethic Era. They were subjugated by a race of Aldmer, the Ayleids, but a rebellion against these rulers, formed under the guidance of Saint Alessia in 1E 242, would prove so successful that Ayleids were driven to extinction (though they left behind many treasures). The Alessian Empire united Imperials and pursued campaigns in other provinces, but when the Colovian west broke away, the resulting civil war in Cyrodiil ended the Empire. The eastern Nibenay Valley region and the western Colovian Estates developed distinct cultures, but still united under the Colovian Reman I to repel an Akaviri invasion in 1E 2703, creating the Second Empire. The Akaviri had devastated many human lands, and Reman feared invasion from the Summerset Isle, so he allowed the remaining Akaviri to live and fight for him against the Elves. Soon the Second Empire controlled every province of Tamriel except Morrowind. The events surrounding the attempted conquest of Morrowind led to the end of the Reman emperors, and the First Era, in 1E 2920: the Akaviri Versidue-Shaie, who had earned a position as a trusted advisor, took control following the deaths of the Remans and the disastrous Four-Score War. 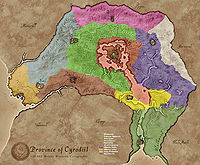 The Akaviri Potentates would rule until 2E 430, but eventually assassinations and poor leadership would make the Empire crumble, leading to the Interregnum: for four hundred years, petty states all over Tamriel quarreled with each other, especially Cyrodiil. The Imperial Province devolved into a collection of warlords squabbling over a no-man's land of cultural stagnation. Eventually, it would take a Nord to reunite the Imperial Province: Tiber Septim was appointed general of the forces of Cuhlecain, a petty Colovian king. He routed all of Cuhlecain's enemies who would face him and his armies on the battlefield, quickly reuniting Cyrodiil. When Cuhlecain was assassinated in 2E 854, Tiber Septim assumed the throne. In a few decades, the provinces would be reunited once more under his Third Empire, and this outsider to Cyrodiil had become the symbol of the whole realm. Ironically enough, most if not all of the Emperors of the Third Age would be Nordic or Breton, not Imperial. Following the cataclysms of the Oblivion Crisis, the leaderless Empire would once again begin to crumble, but it was an Imperial who seized the opportunity for glory: Titus Mede, a Colovian king, would seize the Imperial City with less than a thousand men and declared himself the new Emperor, though not much is yet known about this new dynasty. The defining feature of Imperial culture is its cosmopolitanism. Although some individuals may be the most arrogant bigots in Tamriel, culturally the Imperials are very conciliatory and congenial, making them skilled diplomats and traders. Even Imperial vampires claim some semblance of civility. 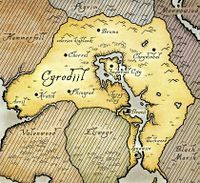 It's easy to understand given their geography and cultural schisms: Cyrodiil borders almost every other province, and the historical separation yet underlying unity and interaction of the Cyrodilic regions made the Imperials well practiced at building bridges and maintaining order. Though there are many regions, the two most powerful effectively controlled all regions close to them: the western Colovian Estates and the eastern Nibenay Valley. Early Imperials in eastern Cyrodiil strongly believed in the Alessian Doctrines, even after the Empire's fall, which made them disfavor many practices, notably farming. They defaulted to mercantilism, and became a wealthy merchant power with a vibrant society that made colorful clothing, conducted elaborate ceremonies, and loved tattoos and philosophy. Through their river network, they were able to export many goods, including textiles, fabrics, moon sugar, rice and armor. Though their beliefs were monotheistic, they often focused on the numinous nature of some facet of society, and many diverse cults operated openly over the years, dedicated to many animal spirits and hero-gods, as well as ancestor worship. The Colovians, in contrast, took on a more austere but adventuresome lifestyle, in keeping with their Nordic ancestry, and often became mercenaries and pirates. The unification under Reman I didn't eradicate these differences, although, of course, the Eight Divines was predominant all over the province by the end of the First Era. The respect and admiration Imperials had for Tiber Septim is nothing compared to the veneration they have for him as a god of the Nine Divines, regardless of the heresies often espoused about him. His accomplishments inspired them to believe they could do anything they set their mind to. The end of his dynasty was greeted with great mourning, although also with great pride, as his last known descendant, Martin Septim, sacrificed himself to save all of Tamriel. Imperials know all too well that dynasties are destined to rise and fall; all it will take is time before the Glorious Empire once again reigns over Tamriel. Common Cyrodilic names, certain aspects of Nibenese architecture, and Colovian martial tradition (military organization and equipment) should seem familiar, as they are inspired by the real-world Roman Empire. Imperials were not considered a distinct race within the games until Redguard, but have been a playable race in every major entry since. For Imperial names, see here. ^ Events of the Oblivion Crisis. This page was last modified on 15 December 2018, at 17:37.